First Vapor: Extinguishing smoke of a cherry-vanilla candle. Nose: Butterscotch is most apparent at first. Given several minutes, rich marzipan and orange zest come to dominate for the main theme. Repeated inhaling brings a background of hazy vanilla with red grape flesh. Palate: Sweet orange & strawberry entrance, becoming nutmeg-y orange rind with honey and plum, and fading to vanilla milk with red apple. Finish: Simultaneous feeling of meaty orange and toffee cereal with cream. Medium length and never getting too bitter. A wonderful treat and a worthwhile big step up from the 10 in terms of both smoothness and richness. (If the 10 is a "primer", this could be the "Prime".) Sweet in character but never getting too sweet, the flavors nearly meet my expectations for such a sherry treated malt. From this shade of a whisky, I could only ask for more vanilla and pitted fruit character on the palate (apricot or cherry). Leave this one alone in your glass for about 15 minutes. It almost seems to thicken up in that time. You won't be disappointed. Holy Mother of Malt, the Aberlour 18 is one superb dram! A cha cha cha! Nose: Vanilla bean goodness; Perfect balance of fruit compote, malt, and an orange blossom honey atmospheric cradle that holds it all together. Palate: Sweet red apples, sherry fullness, macadamia nuts, vanilla bean creaminess. Finish: Cereal complexity that exudes dates, toffee, and sherry decadence. I returned a bad bottle of Highland Park today and bought the Aberlour 18 with my store credit, along with a cigar. I felt a longing to buy another bottle of the HP18, but I was gun shy due to the bad experience. I just love HP 18, but it was at the same store where I ended up with a bottle that allegedly had cork rot. At least that's what the manager told me was wrong with the bottle. I don't blame Highland Park. Accidents happen. Still, I don't think it was cork rot. I think it was a quality control issue in the batch I ended up with. But, still, I don't fault Highland Park. I've been buying HP18 for years and the quality was great every time but lately. The nose of that bottle smelled like a cheap bourbon. That's what I thought and that's what the manager of the liquor store reported upon smelling it (without my mentioning it). From my experience, cork rot is more of a mossy, sharp smell that reminds me of mildew and tastes mildewy as well. At any rate, all that's water under the bridge. I will eventually try another bottle of HP 18, and I'm sure I won't be disappointed. Lightening rarely hits the same person twice, but when it does, it almost never hits in the same sad sack in the exact same place on earth. In the meantime, I am really enjoying the Aberlour 18. It's not quite as satisfying (to my palette) as the HP 18 (when HP 18 is at its best) but it's damn near close, yet in a different fruitier less smoky/carmelly way. I could be happy as a clam with a good bottle of HP 18 and a good bottle of Aberlour 18 in my cabinet, along with a bottle of Talisker 18. That would be my perfect "triptych," so to speak. I now rank this scotch at 86. It did not improve with time in the bottle. Au contraire. I found it tasted best when first opened. Interesting. I have a new bottle of this and the first couple drams I've had were outstanding. Keeping fingers crossed my bottle stays outstanding. I received the Aberlour 18 and was delighted right off - but within 30 minutes was stunned with some of the most tasty complex scotch I have experienced. OK, that isn't saying very much since I have limited experience but I have been very disappointed in HP18, 12 and Glen Fiddich 15 - plus I have been delighted with Ardbeg Uigeadail and Laph 3Wood. Indeed, right from the start I knew I was onto some very decent quality and it grew from there. I can state some "floral notes in the finish" which is the most advanced I have been for tasting. These Aberlours are really dense and they taste GREAT right off the bat - no waiting around - no "sour/off" smell and taste - just thick and yummy. I highly recommend the 18y - it is very different and, frankly, I think perhaps more flavorful than the A'bunadh. I am sure there is a lot more to come here but at least I wanted to put out a positive to anyone thinking about buying - I will stake my meaningless credibility on it that you will not be disappointed. Update (04/15/12) - As I have "matured" (that is, from 1 month to 2 months - a 100% maturation...), I have slightly downgraded the Ab18 - quite frankly, as Victor assured me - and was correct, the HP18 has significantly increased in quality (I wonder when it will hit a threshold...). I find the more subtle sweetness more appealing in fact than the more overt sweetness of the Ab18. Same with the Tal18 - that went through a disappointing, molding leave experience at the beginning and has now taken so much hold on me that I ordered some from the UK because I could not find it here - at least at a reasonable price or that could be shipped to WA (which is really unfortunate...). One would not regret at least one bottle of Ab18 in their cabinet but if it came down to ordering HP18 or Ab18, I am sort tending to go with the former. I will be back in a month or so with any revisions on this. While what Jesus said - Babes shall speak forth wisdom - may be true in regards to recognition of heavenly matters, it does not seem to transfer to scotch. I would give Balvenie 21 Port Finished a head and shoulders above the Aberlour.... I will likely have this thread deleted as kind of a trial run - and pick up in a year or so after I have a few more bottles under my belt. However, I am making some good progress - just picked up 15 bottles from Neil Jamison at the Whiskey Shop in the UK - who did a GREAT job on pricing and shipping costs for me - it was a pleasure doing business with him to say the least - I focused on bottles which saved some $20 and more compared to US prices - though I note that not all UK offerings are less expensive than in the US so you have to do your homework. My favourite of all the whiskies we sampled - it's the 3rd Aberlour I've tried and I love them all. Strong legs, dark amber colour, like rum. Slightly peaty nose (and wet hay), with raisins, dates and nutmeg. Some peat on the palate, good mouthfeel, currants, sherry, charred wood. Long, spicy, deep finish. Absolutely awesome. Yes, the Aberlour 18yr is a fantastic dram! I am actually sipping on a glass right now. It is probably one of the best "bang for your buck" whiskies out there. I compare it with Mac 18yr, at 2/3 the price. According to the distillery, their 18 Year Old Aberlour is the flagship of the range. 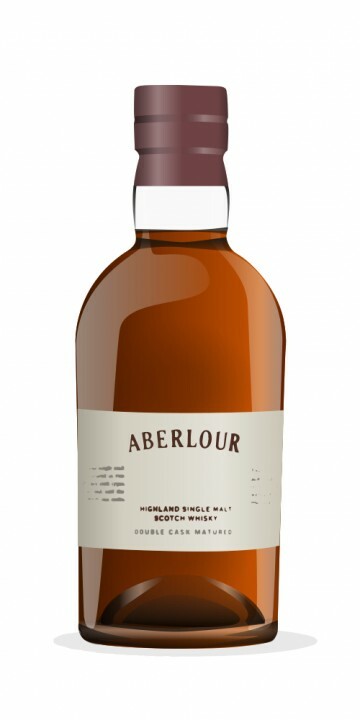 It is supposed to be the ultimate expression of Aberlour, with a perfect structure. Sounds enticing. We’ll find out right away. It has a wonderful colour and beads beautifully. The nose is nicely soft and sweet. Yes, this is great. Honey, apricots, orange (peel included), dark grapes, almond cake and even a touch of eucalyptus. A whiff of smoke completes the picture. Wonderfully complex nose. Very mouthcoating and almost creamy (but not quite), sweet and heavily spiced. Sweet malt, dark fruits (dried plums and apricots, preserved sultanas), licquorice and some mint. Leather. Again, the cake. Quite some punch for only 43%. The finish is bittersweet, nicely balanced and lasts quite long. This is really good stuff. The perfect dram for pastries or other desserts. A big thanks to my friend Bart for the sample. I've been underwhelmed the last couple of times I've tried it. I love the nose, but it seems to have developed a bitterness since I put it in a smaller bottle to avoid oxidation, and the palate seems to have deteriorated. Sounds great- have added to my wishlist. Have never seen this one on display anywhere. This is faultless, excellent Whisky. Absolutely exquisite on the palate, melt in the mouth flavors, oranges, toffee, parchment, gentle oak and smoldering light smokiness that swirls and vaporizes with a hint of sherbet finish. Choose this over Highland Park 18yo, hands down, lighter and smoother, and a contender for the Highland Park 21yo at half the price. A drop of water simply expands the dram and lengthens the pleasure but great with or without. Thanks Gents - you input is very helpful - inc. not leaving decanted very long. I have been hesitant to put anything back into the bottle once it has come out for fear of damaging the existing contents. Is that fear somewhat unnecessary as long as the transition is clean? @Victor - I noticed that you had some Laphroaig 18 in your cabinet. I was similarly dissatisfied with my Laph Triple wood compared to my original restaurant experience. I suspect the same facts may hold here and I will give it a try. I guess I need to get a decanter! The Aberlour 18 is a very good Whisky - the a'bunadh just offers the extra kick from the cask strength and is a bit more on the wild side. The Talisker 18 is one of the really great Whiskys; it offers a more refined Taliskerprofile with depth and complexity - good recommendation @mattberg. I think most Whiskys reach their peak at the age of 18 to 21 years - afterwards the character of the destillery is more or less overpowered by the aromas from the aging in the oak (of course there are exceptions...) You could also try the Laphroaig 18 or Caol Ila 18 if you like peated stuff or the excellent Longrow/Springbank 18. Other sherried alternatives are Glendronach 15 Revival or Glengoyne 17. This is one of my favorite single malts. A super smooth whisky with a outstanding and balanced finish of vanilla, citrus, peach and butterscotch. It has a almost perfect structure. The color is dark golden. The A'Bunadh is a COMPLETELY different beast compared to the rest of the Aberlour line, as it is bottled at cask strength. This 18yr is an exquisitely crafted delicate whisky that is as smooth as butter with just a bit of spice on the finish. Yes I agree with jwise. The A'Bunadh is a real sherry "monster" and completely different compared to the 18 yo. I have both the 23 and the 24 batch of the A'Bunadh and it is amazing. I highly recommend it!